Amy & Joanne Write On! Kirkus Reviews calls Wicked Good “a funny, frazzled tale of extreme parenting.” Please visit our website at www.joannelewiswrites.com. E-mail us at jtawnylewis@gmail.com. Our blog has moved to our new website: www.joannelewiswrites.com. Please come for a visit! Very often what makes a novel a rich experience for a reader is not readily seen on the page but lives in the spaces between the words. This is where subtext and symbolism are found. Let’s start with definitions. Subtext is the implicit meaning of the text. Symbolism gives meaning to the words beyond what is described. Here are examples from my novel, Wicked Good. In chapter 11 of Wicked Good, Archer, exhausted and frustrated, finally finds Rory at the Mobil-to-go with bad girl, Trish. Archer sees Trish slip candy into her pocket. She looks at Rory’s bounty on the counter as Trish walks up next to them. Archer holds out her hand. Trish takes the Milky Way out of her pocket and drops it into Archer’s palm. The action of Trish dropping the Milky Way bar into Archer’s hand has an obvious meaning – Trish was caught almost stealing and had to fess up – but it also has an implicit meaning, a meaning beyond the act of Trish dropping the candy bar into the palm of Archer’s hand. What might that meaning be? Could it be suggesting something about the future relationship of Archer and Trish? In Wicked Good, there are many references to willow trees. Archer and Rory live on Willow Street. There is a willow tree in the back of the house that Archer and Rory planted when they moved in. Willow trees are easily conjured in a person’s mind. The long branches and hanging leaves can suggest foreboding but also hope. 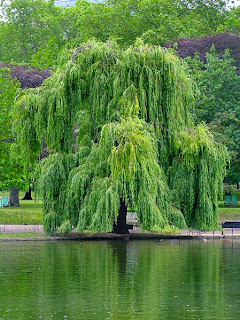 In chapter 27 of Wicked Good, Kitty runs from Rory chanting a spell, which includes the mention of a willow tree. Is Rory only speaking those words to help Trish, or is there a deeper meaning? And how does Rory’s use of the willow tree to heal juxtapose with the willow tree being used by Kitty as a spell? Every novel that grabs a reader’s heart is rich in subtext and symbolism. But remember to keep it subtle. If in Wicked Good we had explained the Willow tree as a symbol, it’s effect would not have been the same. And if after Trish drops the Milky Way bar into Archer’s palm, Archer says, “I guess this is the start of a beautiful friendship”, the development of their relationship throughout the novel would not have been so moving. The words – and the spaces between the words – are richer with the addition of symbolism and subtext to your fiction. Joanne Lewis is the co-author of the award-winning novel, Wicked Good. To learn more about Wicked Good, please visit www.amyandjoanne.com. I foster dogs through my local animal shelter and recently brought home Ace, a one-year-old puggle named after the Snoopy flying ace character. Ace had been hit by a car and his family could not afford to have his broken leg fixed. They surrendered him to my local shelter. After surgery, he needed a place to heal his clipped wing. It took Ace a few days to get used to us. But once he did, we all fell in love. Ace knew his jobs - to snuggle up with me while I slept, to wake my 17-year-old son Ryan for school, to be accepted by Brendan - my 19-year-old son who is on the autism spectrum - and to find his way into the heart of my big old grumpy poodle. Ace didn’t know his other job was to get strong. He approached all his jobs like the ace that he was and three weeks later, his wing was healed well enough so he could be put up for adoption. It was time for Ace to fly. I didn’t want to let him go but I couldn’t keep him. He had his wings. It is not just dogs developing their wings in my household. My 19-year-old has Asperger’s syndrome and doesn’t like disruptions in his routine. He doesn’t like to be far from his coping mechanisms - DVDs blaring on his laptop and music on his I-pod. He began to panic when his laptop starting malfunctioning days before he and his brother were going to visit family in Washington, D.C. I began to panic as well and took him to buy a new laptop to avoid a break down. There was a minor melt down on the way home from the store when they didn’t have the laptop he wanted. We got home and I escaped to my bathtub. Forty minutes later, I went downstairs. Laptop, I-pod, DVD player and cords were scattered all over my kitchen table. He had fixed whatever had malfunctioned. "So you are all set for the trip?" "I'm still suspicious, but yes," he smiled. He had done it. He had figured it out and although he still had his doubts, he was okay with it. He had the wings he needed to go on his trip. Then there is Ryan, my younger son. I don’t think he knows how much I love him and how terrific he is. He knows that I am always paying attention to his older brother and that I frequently bring foster dogs home for short periods of time. But Ryan is an amazing kid. He makes honor roll at school; he is a high achiever in football and track; he is funny; he is helpful around the house; he accepts the dogs I bring home as his own; he loves his brother. Ryan is gaining his wings, literally and figuratively. He is taking flying lessons. He wants to enlist in the air national guard in hopes of qualifying to be trained as a pilot. He asked about going to boot camp this summer, between his junior and senior years of high school. I said no. I am not ready for him to grow his wings. Amy Lewis Faircloth is the co-author of the award-winning novel Wicked Good, the story of a mother and her adopted son who has Asperger's syndrome and searches for his birth parents. 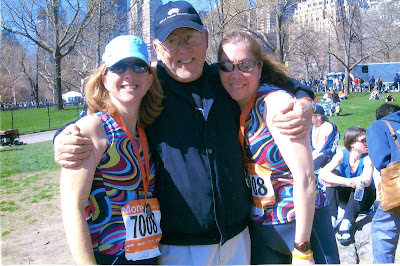 Posted Oct. 02, 2011, at 8:28 p.m.
Last modified Oct. 02, 2011, at 8:59 p.m.
Joanne Lewis (left) and Amy Lewis Faircloth. 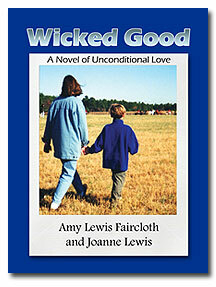 WICKED GOOD by Amy Lewis Faircloth and Joanne Lewis, August 2011, Telemachus Press, $9.95, 250 pages. Rory wears black clothes covered in skulls to keep other teens away. He doesn’t want people to laugh at the way he talks, how he paces when he’s anxious or his interest in lawn mowers and all things mechanical. Rory has Asperger’s syndrome (commonly known as AS), and he’s not alone. “Wicked Good,” a first novel by sisters Amy Lewis Faircloth of Hampden and Joanne Lewis of Florida, is about a single mother, Archer, struggling to raise her adopted son, Rory. Their story opens a door into a world that is rarely seen. “‘Wicked Good’ has really touched people,” said Lewis. Rory isn’t a real 15-year-old, but his personality is based on Faircloth’s oldest son, now 19, who has AS. To protect her son’s privacy, she asked that he not be named in the article. AS is a developmental disorder that affects a person’s ability to socialize and communicate effectively. Children with the syndrome typically exhibit an all-absorbing interest in specific topics, according to Mayo Clinic staff. But there is a long list of AS symptoms that vary depending on the person, including inability to sleep, poor decision-making, lack of empathy and difficulty reading nonverbal signs. Though the incidence of AS is not well established, experts conservatively estimate that two out of every 10,000 children have the disorder, according to the National Institute of Neurological Disorders and Stroke. Named after Dr. Hans Asperger in 1944, AS is described as high-functioning autism that affects people with high and low IQs. Some people believe that celebrated geniuses Einstein and Mozart had AS. “Wicked Good” unveils one experience of AS through intense dialogue and a dramatic, fictional plot that keeps the action rolling. 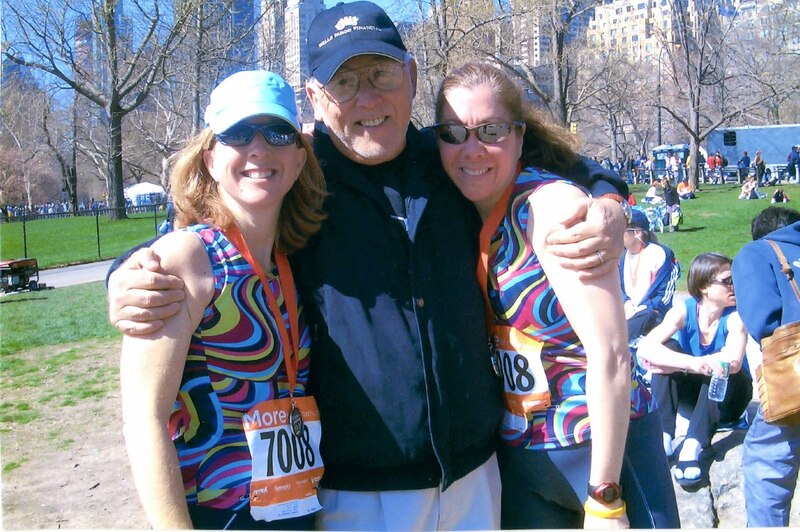 Lewis and Faircloth grew up on Long Island, N.Y., and both became attorneys. But while Lewis has been writing novels for years, Faircloth, a Bangor attorney, has no prior experience with fiction. The novel began as a way for the sisters to do something fun together, and it evolved into them wanting to educate people about AS through fiction. The novel took them three years to complete, and after having a difficult time finding a publisher, they decided to create a blog and post chapters on the Internet accompanied by photos of places in Maine and Massachusetts that they visited to research for the book. Their blog gained followers, and after just two months, a publisher from a small press contacted the sisters. Now the entire book is published as an e-book (March 2011) and in paperback (August 2011). Faircloth used her experiences and knowledge, with the help of her two sons, to accurately write the family scenes. But as the story of acceptance progressed, the characters took on a life of their own. Rory’s violent outbursts and Archer’s battle with alcoholism are things that Faircloth has never personally experienced in her family. Lewis wrote much of the historical fiction subplots (about the Salem Witch Trials and The Perfect Storm of 1991) and steered the plot to be a classic hero journey, which involves 12 stages, including a stage where the hero hits rock bottom. In “Wicked Good,” many heroes collide and help each other along. Archer is battling addictionand a selfish ex-husband and is constantly doubting her parenting skills. Rory is on a quest to find his birth parents, understand AS and be a better son. And Rory’s troublemaking friend, Trish, quietly combats parental abuse and the stigmas surrounding her. Though the main characters have no problem being in the spotlight, there is a richness and diversity of peripheral New England characters — the local policeman, the high school principal, gas station clerk, law firm assistant — and a web of unique relationships that links them all. Trish, an unexpected scene stealer, has unresolved conflicts at the end of the book that will be picked up in “Wicked Wise,” scheduled to be published in 2012. In the sequel, 19-year-old Rory will be on a search for a “cure,” a mission catalyzed by bullying he endures at school. “Wicked Good” has won the online 2011 Reader Favorite Award and it is among the finalists for the Royal Palm Literary Awards, the winner of which will be the determined Oct. 22 at a writers conference the sisters will attend together in Orlando. Since starting the blog, Faircloth has connected with other bloggers, authors and readers who know people with AS. Wicked Good by Amy Lewis Faircloth and Joanne Lewis, Blog Tour & Giveaway Contests! Climb aboard The Mowchine because we’re riding into fall with wicked good novel and lots of fun events, including two contests! Rory is a teenage boy struggling in a world that doesn’t understand him. He is as intelligent, witty and creative as he is destructive. Like all teenagers he seeks a sense of belonging and decides that his birth parents might just understand him better. Wicked Good is part drama, part mystery...with a dose of humor. The authors take us on an emotional rollercoaster as we journey with their flawed-but-loveable characters, weaving in social issues and bits of New England’s history to make an entertaining read. Along the way we find ourselves gaining a better understanding of Rory’s world and the love shared between mother and son. Wicked Good is available for purchase in both print and e-book formats at Amazon and at Barnes & Noble. My sister and I have written a novel called Wicked Good. It's the story of a mother and her son with Asperger's syndrome. People frequently ask how it came to be that two sisters wrote a novel together while living in different states. It was March. The snow was dirty brown and the sun was absent here in Bangor, Maine. I was spending a lot of time on my sofa, channel surfing and landing nowhere. Joanne called from her home in Florida. “Wanna write a book together?” she asked. I wrapped the afghan around me tighter and yawned from lack of blood flow to my brain. “Sure,” was the best response I could muster. I am a lawyer by day and single mom to two teenage boys by day and night. My oldest is diagnosed with Asperger’s syndrome, a form of autism which has been of mixed blessings to my life. Joanne is the literary brains behind this outfit. I can only write based upon my life experiences. Without Joanne moving the plot along, we would be nowhere. On the other hand, I have the experience. My son is now 19 years old. Life has been a challenge for both of us. The incidents in our novel Wicked Good are fiction. But many of the characteristics of the mother and son have basis in authenticity. For example, once my son gets an idea in his head, it is tough to dissuade him otherwise. The teenage character Rory in Wicked Good is the same. As another example, juggling my son's needs with my job truly does stress me out and the bathtub is a frequent refuge; just like it is for Archer, Rory's mother in Wicked Good. However, my son has never hit me and I do not have a drinking problem. I don’t think I ever imagined we'd actually get a book written or that it would be published. But now that we have done it, I've found another way to deal with the stress of raising a child on the autism spectrum - writing. Of course, it wouldn't be as much fun with anyone else but my sister. As Rory would say - I really really love you, Dad. Amy and Joanne. Simple theme. Theme images by luoman. Powered by Blogger.